Psst...our Paleo AIP Mustard is gearing up for production! A preview of our AIP "mustard" label! One day, while browsing the aisles at my local Natural Grocers, I came across a can of butternut squash and I wondered if that could be a good base for an AIP mustard. From there, I picked up several cans and started researching other AIP-friendly ingredients that could create an authentic mustard flavor. I won’t tell you everything that’s in it right now, but we added horseradish powder, organic honey, apple cider vinegar, and several non-nightshade spices to create an mustard style amazing flavor. In the next couple of months we are launching an online store where you will be able to purchase all our products directly from us, including our new AIP mustard. This will be an exclusive KC Natural product for the first few months while we ramp up production. From there, it will be available to our online and retail sellers. So, be sure to follow us on Instagram, Facebook, or Twitter to learn when this exciting product is available. 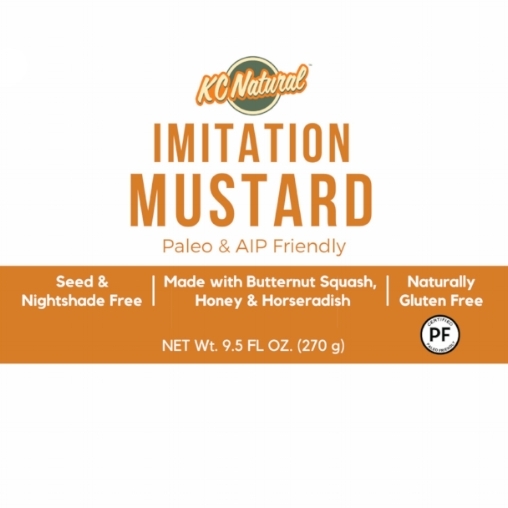 And if you want to receive discounts on KC Natural products, including our brand new mustard, be sure to sign up for our monthly newsletter. We promise not to spam you, or share your info. And if you haven’t had a chance to try our new No Tomato Pasta Sauce or Imitation Ketchup, we think you’ll love them as much as our Mastodon and Primal Cherry BBQ blends. If you do love our products, be sure to leave a review on Amazon and share your KC Natural recipe ideas with us on social media too. As a small company, it really helps us get the word out about our AIP products. And we love getting new recipe inspiration from people who are already fans. Thanks again for supporting KC Natural. We hope you’re having a wonderful holiday season!